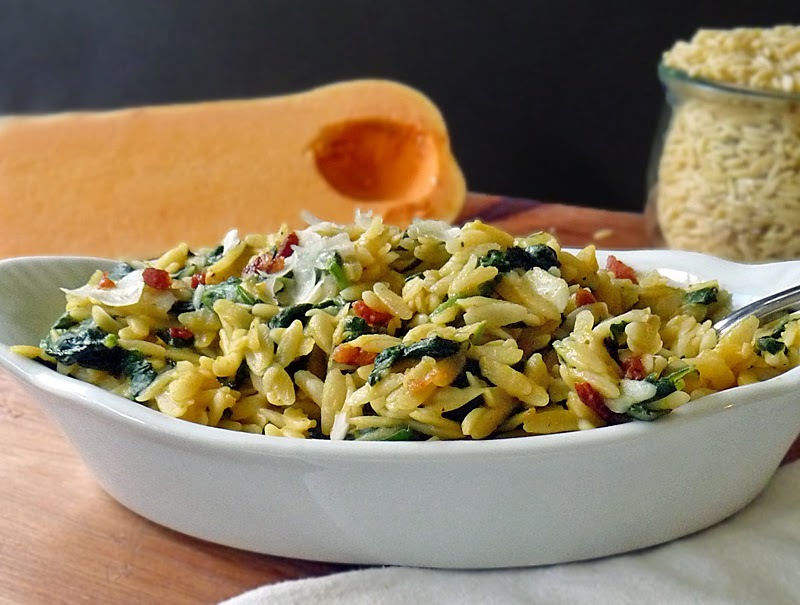 Butternut Squash Orzo Pasta is an easy-to-make, delicious side dish full of all the healthy goodness that is butternut squash. It's also super versatile! A real winner! Although, I am calling this a side dish, it easily converts to a satisfying main simply by adding your favorite protein. Or leave out the protein and enjoy this as a meatless meal. Your choice! No matter how you serve this pasta dish, you can bet it will make a splash! With the wonderful combo of creamy butternut squash puree, fragrant sauteed garlic spinach, and the salty goodness of grated Parmesan Cheese, this pasta dish will make a great addition to any meal! Most especially the big one - your Thanksgiving Feast! 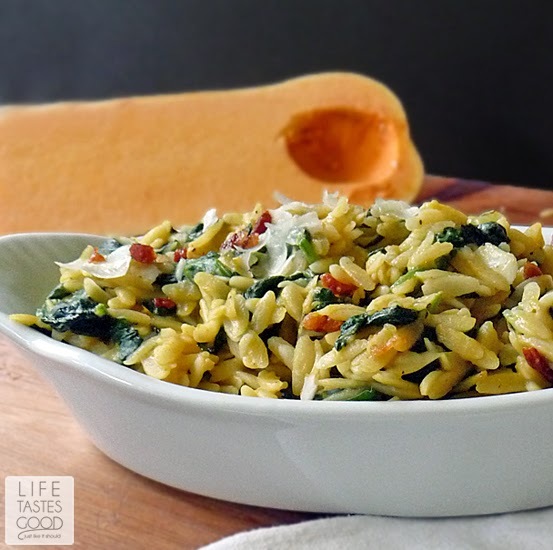 This Butternut Squash Orzo Pasta was inspired by my Orzo Pasta with Spinach and Parmesan. Hands down that recipe is the most popular on the blog, and it doesn't surprise me one bit! It is full of flavor, easy-to-make, and versatile too. I couldn't resist putting a new spin on it! Be sure to scroll down and check out all the deliciously lightened up recipes being served up this week by the #SundaySupper family, and stop by and say a great big thanks to our wonderful host, Kathia of Basic N Delicious, for all her hard work in making this event possible! Thanks, Kathia!! In a large skillet, melt 2 tablespoons of butter. Add 1 tablespoon minced garlic and saute for about 30 seconds. Add the baby spinach and a pinch of salt. Saute until wilted. Remove to a plate and set aside until ready to use. 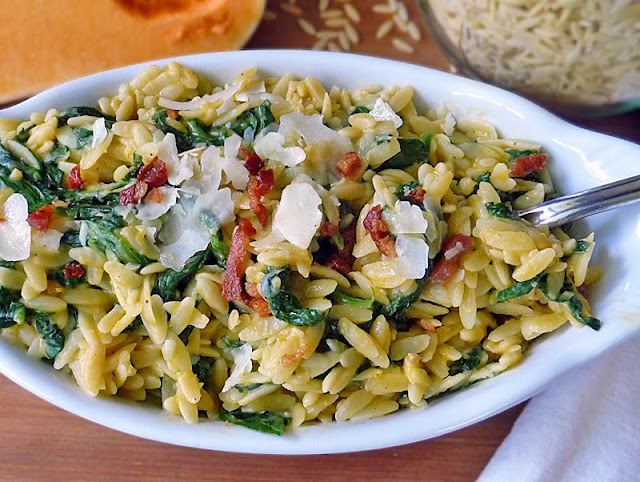 In the same skillet, melt 2 tablespoons of the butter over mid-high heat and add 1 cup orzo. Stir until lightly browned. Add 14 ounces of water and 2 teaspoons chicken base and bring to a boil. Cover. Reduce heat and simmer for about 15 minutes until the orzo is tender and the liquid is absorbed. When the orzo is done add the spinach, 1 cup Butternut Squash Puree, and 1/2 cup Parmesan cheese. Mix well. Give it a taste and add salt and pepper as needed. The Parmesan will add some saltiness to the dish, so be sure to give it a taste to ensure you don't add too much salt! Enjoy! Thanks! 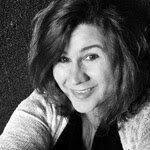 and Thank you for hosting, Kathya! This looks good! I love orzo. Ooooh baby that looks good!!! I love everything about this recipe! Wish I could taste it right now! Okay, hands down in love with this dish, I have to make it very soon!! Thanks, Tara! I hope you like it as much as we do. We really enjoyed the butternut squash in this - so flavorful! 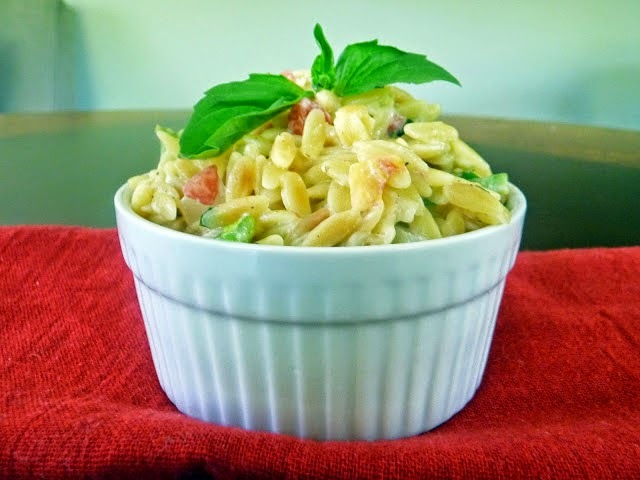 I make orzo often and will definitely add this to my recipes! Thank you. Thanks for stopping by, Chris! If you get a chance to make it, I'd love to know how you like it. Thanks again! This would make a fabulous side for a holiday meal!! I couldn't agree more! Thanks, Bobbi! 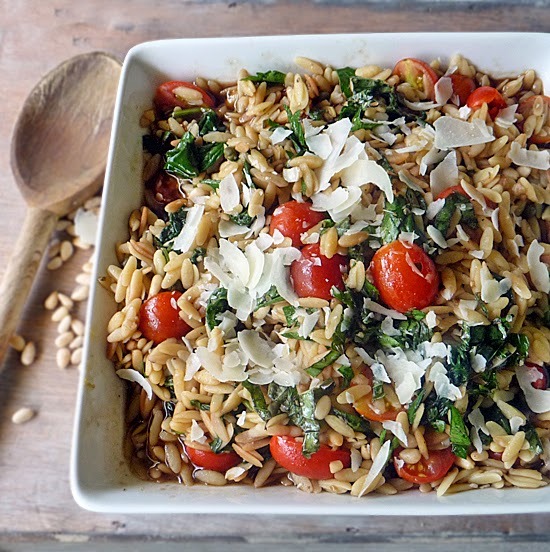 I love orzo and your additions have made a spectacular side! Mine too, Shaina! It is sooo good! Thanks for stopping by! I love butternut squash mixed with all kinds of pasta! Your dish sounds delicious and looks pretty too! Thanks, Carrie! It will be on my Thanksgiving table for sure! I'm not certain I've had orzo pasta before, and last year was my first time cooking with butternut squash... I'd love to give this a try! Yvonne you must try this! Orzo is wonderful with which to work. It is so versatile. 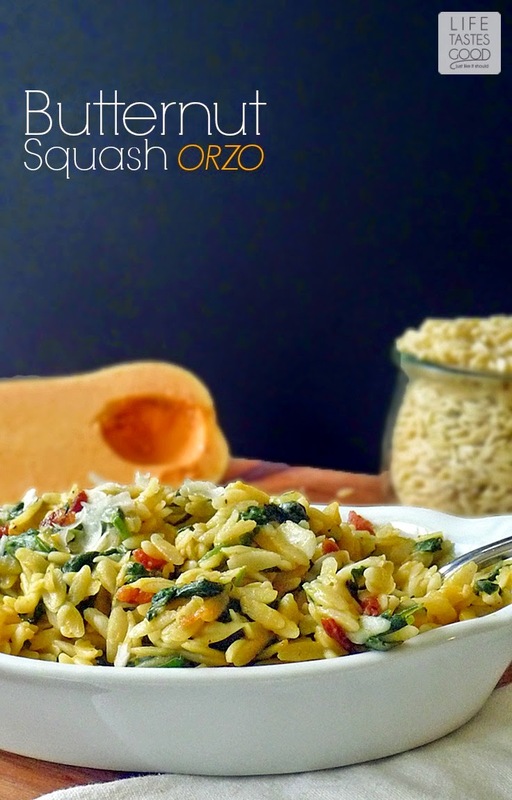 I love creating recipes with orzo! This look fantastic. I wish I had a bowl for lunch today. Thanks for sharing with #SundaySupper! I will be making these soon. I love butternut squash in just about anything, so I know I'd love this! A great dish to serve at Thanksgiving! OMGosh this looks so amazing and full of flavor. I love butternut squash and love how you used it in this recipe. I love orzo so much! This looks like such a flavorful recipe! Thanks for sharing! I love orzo pasta, who doesn't? This would be fabulous, either as a main or side dish! I agree, Julie! I'm always surprised when someone asks me 'what's orzo?' So many people haven't tried it. That needs to change haha Thanks for stopping by! I love the idea of serving this for Thanksgiving! Spinach and butternut squash are two of my favorite veggies! I'm loving this fall side dish. So many great flavors it it! yum! I'm ready for this my an entree, Marion! I often make this and have it for my entree! It's a nice light meal. Thanks for stopping by, Cindy! Ooh that's a great idea for butternut!